I am trying to keep abreast of the Wine Lover’s Calendar, and diverging from my usual writing, with the topic of “Open That Bottle Night.” It is the concept of opening a bottle of wine that you have been saving for a special occasion that never seems to occur. The wine could be expensive, or just has a great sentimental reason. The idea is to go and enjoy it, instead of leaving it collecting dust in the cellar, though the bottles do look cool that way. This special day for wine, was started from an article in the Wall Street Journal by Dorothy J. Gaiter and John Brecher and I would say that it has been taken to heart by other writers, so I thought I would give it a try. The other night I wrote about the “National Drink Wine Day” and I discussed about the first case of wine that I ever bought, and I thought that I still had a bottle of it, well I did. I dislike belaboring a subject, but I thought that I should continue talking about this wine and this was the perfect day to open it. When I was down in the cellar, making sure that I still had a bottle of it, I looked up at a wall of paneling in the cellar; that consists of the panels from assorted wooden wine crates from back in the day, and I had given this end panel a position of status. I guess that I am a sentimental raconteur and pack rat. Considering that this was my last bottle of wine from the case, I decided to see if I could find anything new about the wine and winery. There is a plateau between Pauillac and Saint-Julian-Beychevelle and it is referred to as the Pauillac Bages plateau. 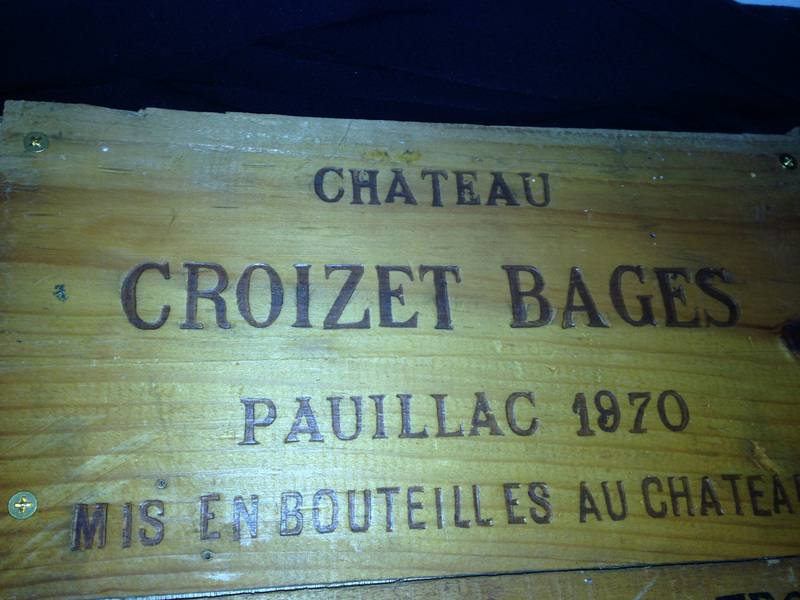 Chateau Croizet-Bages takes its name from the original creators the Croizet brothers. These two brothers bought parcels of vines from their neighbors during the first half of the Eighteenth Century and created their own successful vineyard. During the Revolution the brothers sold the estate and it was resold again just two years before the famed 1855 Classification of the Medoc. The current owners, the Quie family, acquired Chateau Croizet-Bages in 1942 from an American entrepreneur Jean-Baptiste Monnot (who had bought the estate at the end of The Great War). The chateau is still managed by the Quie family. The vineyards consist of Cabernet Sauvignon, Merlot and Cabernet Franc. 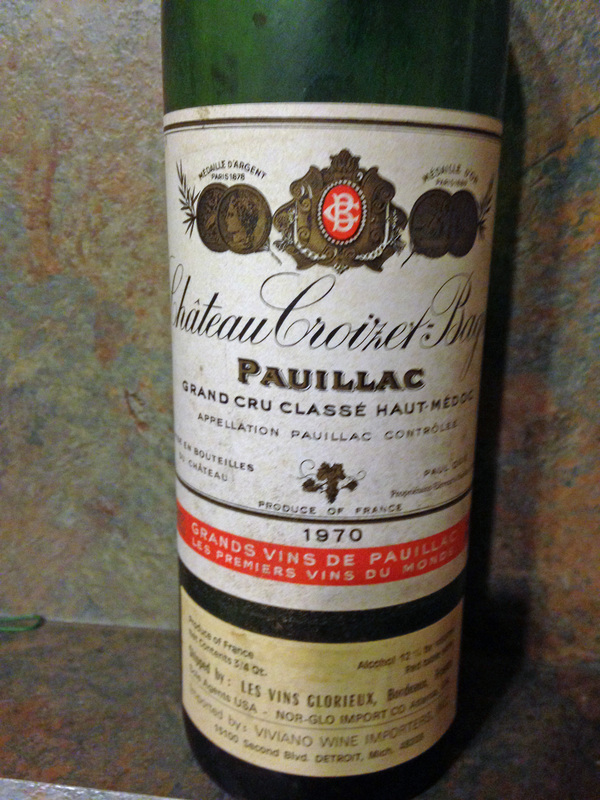 So, it was a bittersweet moment as I unwrapped this bottle of Chateau Croizet-Bages Pauillac 1970, it was wrapped still in tissue paper, which I used to do when I first started collecting wines to protect the bottles from light, and it was the last bottle in my cellar from this old tradition. After I cut away the foil cap, the cork looked like it had seen better days, and my corkscrew had nothing to grab onto, and my cork-puller also could not remove all of the cork. So I pushed the rest of the broken cork into the bottle, as I knew that this wine would need some decanting anyways. I used my trusty coffee filter in a funnel technique and decanted the whole bottle which caught cork debris as well as the sludge that I had anticipated from a forty-five year old bottle of wine. The color was that soft shade that aged Clarets get, and there was still a nose, though a bit feeble, but even my Bride was a bit excited that there was still a nose to be discovered. The wine still had grace, the tannins were gone, but there was still some fruit. I guess cellaring from day one was good for this wine and I am glad that I had it when we did. I am not sure that it would have survived its fiftieth birthday. This entry was posted in Wine and tagged Cabernet Franc, Cabernet Sauvignon, Chateau Croizet-Bages, France, Merlot, Pauillac. Bookmark the permalink.